DO YOU FEEL LIKE SAILING IN CROATIA? Yes, I feel like sailing! Croatia is one of the hot spots to enjoy amazing sailing holidays, either in a sailboat, a yacht or a catamaran. It has a nice Mediterranean weather, calm sea, amazing landscapes, more than one thousand islands, delicious food and plenty of reasons which make Croatia one of the most attractive places for boat rental. Are you thinking about enjoying an unforgettable sailing holidays around croatian coasts? I´m pretty sure it will be a great experience, however preparing your sailing trip could be a little bit messy. There are so many bases and sailing routes around the area that it´s possible you don´t know where to start. That´s why we would like to share with you one of our favourite routes to sail around Croatia; The islands of Central Dalmatia. The yacht charter offer in Central Dalmatia is huge, with special focus in the cities of Split and Trogir. Rent a boat in Split to sail a week with your family or friends is easy, quick and safe with Yanpy. Our partners are the best charter companies so we can offer the best yachts and quality service. If you can´t wait to live an adventure sailing around Croatia, keep reading. 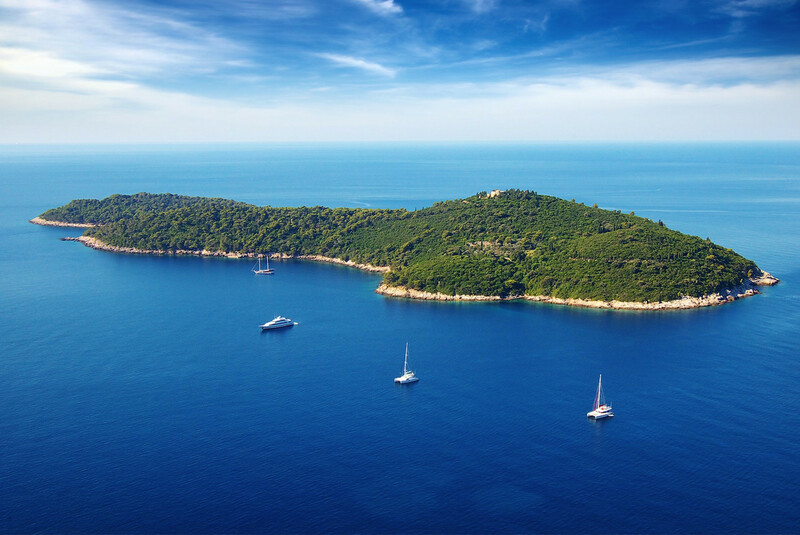 Why has Croatia become a top destination for yacht charter? Croatia is a mediterranean country brimming with culture and history. The old town of Dubrovnik and Trogir are world heritage sites by Unesco. Its nature is exuberant. National parks such as Plitvice, Kornati or Mljet could be from fairy tales. Croatian people used to say that they don´t need a navy because they are protected by millions of aircraft carriers. That´s why Croatia has more than one thousand paradise islands covered by pines forests that baths in coves and beaches with crystal clear water. It has also plenty of vineyards and olive fields drawing such a mediterranean landscape. All these are very good reasons to explain why Dalmatian coast is such a paradise for sailing wherther it´s a sailboat, motorboat, catamaran or yacht. Croatian islands are dotted with charming fishing villages where you can enjoy a good wine and a delicious cuisine based on fish and seafood. Their concern for the environment and respect for nature make Croatia a country in an enviable condition where you can enjoy the nature. This, contrasts with the modern marinas offer with all kinds of services for boats, where you can rest comfortably during the sailing trip. But if adventure is never enough for you, then, you can always anchor in a lot of bays, coves and islands. What do you need to rent a boat in Croatia? Each charter company has its own rules so we suggest you to get informed about the requirements before hiring a yacht, but in general terms, a sailing and radio management licenses are required; Moreover, some sailing experience must be proven. If you don´t have much sailing experience and want to enjoy a sailing holidays hopping from island to island, the best you can do is to charter a yacht with skipper (or crew). He will take care of everything and you only will have to relax and have fun. In the end, it is your holiday, isn´t? NOTE: The company ACI Club manages most of Croatian Marinas. On his website you can find relevant information such as telephones, radio channels, etc. Our adventure begins in the city of Split. Sailing trips usually take a week and the checkin is round 17:00 in the evening, so the morning will be perfect for you to discover the treasures of the city. Split is a marine, vibrant and cosmopolitan city. You shouldn´t miss out the old town, a World Heritage Site. Walking down the center of Split is equivalent to do it inside the Palace of Diocletian. Its streets are lively, bohemian, full of painters, musicians and street markets. DO YOU FEEL LIKE SAILING AROUND ISLANDS OF CENTRAL DALMATIA? In the Marina of Split, we will meet our skipper, in case of hired, and our boat for the next seven days. Finally it´s the time. Our sailing holidays on yacht around Croatia are yet to start. Cast off! We are sailing! We will sail in the Adriatic Sea during a week and discover some of the most beautiful islands of the dalmatian coast. Our sailing trip will be quiet, with an average of 3 hours sailing a day to allow us relax and enjoy. This is the longest stage of our sailing trip. We will sail SW for four hours and a half from Milna to Komiza, a fishing village located west of the island of Vis. Today, we will enjoy sailing, the sea and the marine breeze. The island of Vis is a pearl among Adriatic Sea. It served as military base for Yugoslav army, so it was closed for tourists for many years. This has kept the island in a state of enviable conservation. Pristine nature, pine forests, vineyards, fishing villages, and relaxing mediterranean vibes awaits us in this island. Without forgetting the real treasure of the island, its paradise beaches and coves of crystal clear waters. Even if you hadn´t done it yet, it´s likely that when you get to this place, you begin to realize that renting a boat in the dalmatian coast in Croatia is going to be a unique experience you will never forget. We will sail along the north coast to reach our destination today, the town of Komiza. But before, we will make a stop to enjoy a refreshing swim in one of the wonderful bays of this island. The coves that we find in Oključna are a good choice. Rock, vegetation and crystal clear water meet to form an amazing landscape. If you fancy we can drop the anchor to have a lunch, swim or even take a trip walking to the village. Very authentic place, with stone cottages, freezed in the time. After a healthy walk, it´s time to weigh and head to Komiza to complete our jorney of today. A town of seafarers and stories of pirates. A real place where we can enjoy a good lobster and a good local wine. In Komiza, we can moor to buoys to spend a calmed night. Alternative: Before heading to Vis, on the island of Brac you can visit the famous beach of Zlatni Rat, also called the Golden Horn, a beach that changes its shape depending on the tide. You can make an adaptation of the route to make a stop and enjoy a swim in this spectacular beach. Today we will sail along the south coast of the island of Vis to the village with the same name. But before that, we'll have a nice surprise. Our boat will stand in SW to the island of Bisevo. It is said that this island is one of the most isolated and pristine corners of the Mediterranean. Pristine coves of crystal clear water and vegetation, as Porat, provide us with a five stars dip. In addition, you will live a magical experience that you cannot miss. About noon, light rays enter through the famous Blue Cave (Modra Spilja), a small cave only accessible by dinghy. The rays are reflected on the bottom and the water will turn a blue color that you won´t forget. I´m pretty sure after the experience in the cave you are hungry. What about drop the anchor in Porat? It´s a beautiful cove and in the beach, there is a restaurant with a very tasty grilled fish. Want to find a yacht to sail around Islands of Central Dalmatia? On our way to Vis, along the south coast of the island, we will pass by a lot of coves. It will be not easy to choose your favourite. One of the top of them is Stiniva. Surrounded by mountains, pine forests, this cove is almost a lagoon enclosed by cliffs. Another very good alternatives are cove Duboka, Mala Travna, the Srebrna or Zaglav beaches, Rukavac or Stoncica. The latter is very close to our destination today, so we can take the last dip this afternoon in this beautiful cove. Tonight we will sleep in the bay of Vis, where you can have a dinner based on traditional cuisine and good local wine while discussing how wonderful it was our sailing day. Alternative: If you fancy a quiet dinner on the deck under the starlight, drop the anchor in cove Stoncica is also a good idea. Good morning sailors! Today we will sail towards one of the jewels of the Adriatic Sea, the Pakleni Islands. Belonging to her older sister, Hvar, they consist of about twenty islets. Pakleni are a paradise for lovers of sea, nature and sailing. On these islands you will find a lot of beaches to get lost, some of them only accessible by sea. Luckily we charter a yacht to enjoy our holidays. The turquoise waters of Zdrilca on the islet of Marinkovac, then naturist beaches of Jerolim, or the famous Palmizana cove on the island of Sveti Klement are some of the small paradises where we can drop the anchor. It is possible that after a few days of relax and contact with nature, your body asks you to go partying a bit. If you like having a mojito and listen to some chillout music until the sun goes down, or have a good grilled fish, your site is the Laganini Beach Club in Palmizana. If you want to take a step further, Carpe Diem on Stipanska beach on Marinkovac island will be your place. There you can move your hips to the rhythm of DJ at sunset, surrounded by girls and boys with great vibes. You are on holiday in Croatia. It's time to have fun! Caution: You are in posing zone. Selfies and photos in your social networks to make your friends crazy is fully permitted. But beware, your friends could suffer a severe jealousy attack. In case you pass of parties and DJs, and you are looking forward to explore the islands, you´ll find a path from Palmizana beach that will take you to the small fishing village of Vlaka. If you get hot, along the walk you will find several beautiful beaches to cool off. Alternative: If you decided to stay to spend the night on Pakleni, the islands offer several places where we can anchor our boat safely, as the coves of Vlaka, Luka Soline, Tarsce, Duboka Vela or Marina Palmizana in Stevi Klement. And Zdrilca or Stipanska in Marinkovac. Hvar is the trendy island in Croatia, a place of vibrant nightlife where international celebrities walk their yachts. Celebrities like Beyonce, Jay-Z, Bruce Willis, Eva Longoria or Ashley Judd might fall into beach clubs like Hula-Hula Hvar or Falko Bar. However Hvar is not only that. Beaches and coves of white sand, clear waters and pristine pine forests and aromatic herbs perfume this mediterranean island. Greeks, Romans, Venetians and Turks left their mark on many roads, streets ivory-colored stone, convents, churches and fortresses. Definitely walk around the streets of the city of Hvar it is a feast for the senses. Today, we will explore which is undoubtedly one of the most beautiful islands in the Mediterranean. 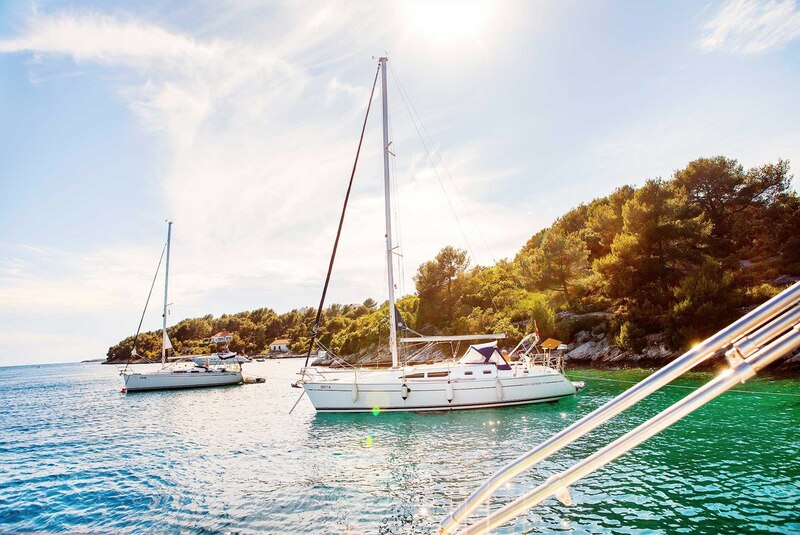 After discovering the treasures of the town of Hvar, our rental boat sail to discover some of the idyllic coves hidden in the island. If we head east, we can reach the amazing Milna, Lucisce, Dubovica or Zavala. We can cool off in one of them and then head back to west along the rugged coastline to our destination. The town of Stari Grad. On our way we will find endless coves such as Plibinja, Jagodna or Stiniva. Bonus track: The east side of Hvar is more unknown than the west. Here we can find a good number of beaches and coves less crowded. In the Marina of Stari Grad we can find buoys and moorings to moor our boat and enjoy a safe and peaceful night. Stari Grad is an ancient fishing village, stone houses and bohemian poets. In summer many residents open their homes to offer dishes based on fish and seafood proper of local cuisine to the tourists. A charming place where come to the end our fifth sailing holiday day on the dalmatian coast of Croatia. All hands on deck! Today we have a peaceful sailing day from Stari Grad on Hvar to Maslinica on the island of Solta. Our sailing week around the central dalmatian coast in Croatia is coming to its end, but don´t be sad. We have a couple of days ahead full of sunbathing, pristine beaches and laughs with our family or friends aboard our yacht. Our yacht sails course NW direct to the beautiful island of Solta. Like her sisters, Solta is very quiet mediterranean island, covered with pine forests, vineyards and olive groves. The coastline is dotted with deep stone coves and crystal clear waters. Idyllic natural harbors to anchor our boat. If you prefer a safer anchorage port Maslinica or its neighbourg Sesula will give the necessary protection to spend an easy night. During the day we can sunbathe or swim in coves such as Tatinja or Poganica. In the islets in front of Maslinica you will find turquoise waters, perfect for scuba diving or snorkel. We will have a tasty seafarer´s meal and toast with our friends or family with a good local wine. In the afternoon, you can rent a bike to explore the island. Grohote is a streets, houses and stone walls made lovely village, surrounded by fields of crops that will take you to medieval times. A treasure that you can not miss out. Today is the last day of our sailing holidays in Croatia. In the morning we'll find a place that truly deserves our last swim in the Adriatic. This place is definitely Krknjasi Bay on the island Drvenik Veli. A corner of untouched nature where olive groves populate the land and turquoise waters bathe its coves and beaches. A perfect place to dive, snorkel and take our last rays of sun. Around noon we head to the city of Trogir along the island of Ciovo. We moor in one of the nearby marinas like Marina ACI Trogir, C&N Marina Trogir or the Yacht Club Seget. We can also anchor freely on the island of Ciovo. The old town of Trogir is a Unesco World Heritage Site. The city rests on an island connected to mainland by a bridge. Trogir take us to the middle ages walking among fortresses, walls and cathedrals. A cultural touch that certainly you can not miss. Finally, our boat will head to E to take us to our final destination, the Marina of Split, where the next morning will checkout. What do you think about our route? Ah, if you liked our post, share it with your friends. Hola Yanpy. He leído tu extraordinario relato de la derrota Split-Split en 7 días. ¿Tienes algo parecido continuando hasta Dubrovnik o Dubrovnik-Dubrovnik? Hola Roberto, muchas gracias por tu comentario. Nos alegra que te haya gustado. Tomamos nota de tu sugerencia. Es una ruta de navegación interesante. Un saludo, El equipo de Yanpy. Hola Mónica, te contactaremos para enviarte nuestra mejor oferta de catamaranes para tus vacaciones en Croacia y resolver tus dudas. Un saludo, El equipo de Yanpy. Hola Víctor, nos alegra mucho que te resulte interesante. Gracias por confíar en nosotros y esperamos que disfrutes mucho de tu viaje en barco por Croacia. Hola Beatriz, en Yanpy encontrarás todo tipo de barcos de alquiler para tus vacaciones en Croacia. Te contactaremos para ayudarte a encontrar el barco perfecto. Gracias, El Equipo de Yanpy. Buenos días Antonio, nos hace muy felices recibir comentarios como el tuyo. Nos alegra que te haya resultado de utilidad. Te animamos a compartirlo. Esperamos que disfrutes mucho de tus vacaciones en barco navegando por Croacia y dado que vivirás la experiencia de primera mano, esperamos que nos cuentes cómo te fue a la vuelta! Un saludo, El Equipo de Yanpy. Buenos días Andrés, gracias por tu comentario. Disponemos de más de 1000 barcos de alquiler Croacia. Desde veleros, catamaranes, a motoras o yates. Los precios varían según tipo, características y temporada. Te contactaremos por email para conocer más detalles sobre cómo te gustaría que fueran tus vacaciones en barco y poder enviarte un presupuesto totalmente gratuito. Un saludo, El equipo de Yanpy. Buenos días Ricardo, gracias por tu comentario. Procedemos a enviarte un presupuesto para el alquiler de un velero una semana en Dalmacia Central. Un saludo, El equipo de Yanpy. Hola Pedro, nos alegra mucho que le guste nuestra ruta para navegar por Croacia. Le contactaremos por email para enviarle un presupuesto para disfrutar unas vacaciones en barco por las islas de Dalmacia Central con su familia. Un saludo, El Equipo de Yanpy. Can i call your company to ask questions? What number can I call. I tied the number on the site, it did not go through. I am in sicily now. My number is ***********, from the USA. Dear Alan, thanks for your comment. We will contact you to help you by private email or phone. Kind regards, The Yanpy team. Hola Noelia, gracias por tu mensaje. Estoy seguro que encontraremos el viaje en barco por Croacia perfecto para ti. Te contactamos por email para concretar detalles. Un saludo, El equipo de Yanpy. Buenos días Jorge, gracias por tu comentario. Te contactamos por privado para enviarte un presupuesto de vacaciones en Croacia. Un saludo! El equipo de Yanpy.